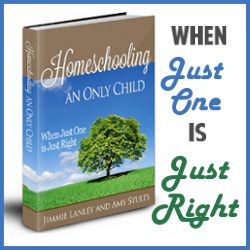 Welcome back to my Homeschool Spring Cleaning series. Yesterday I addressed mental clutter. 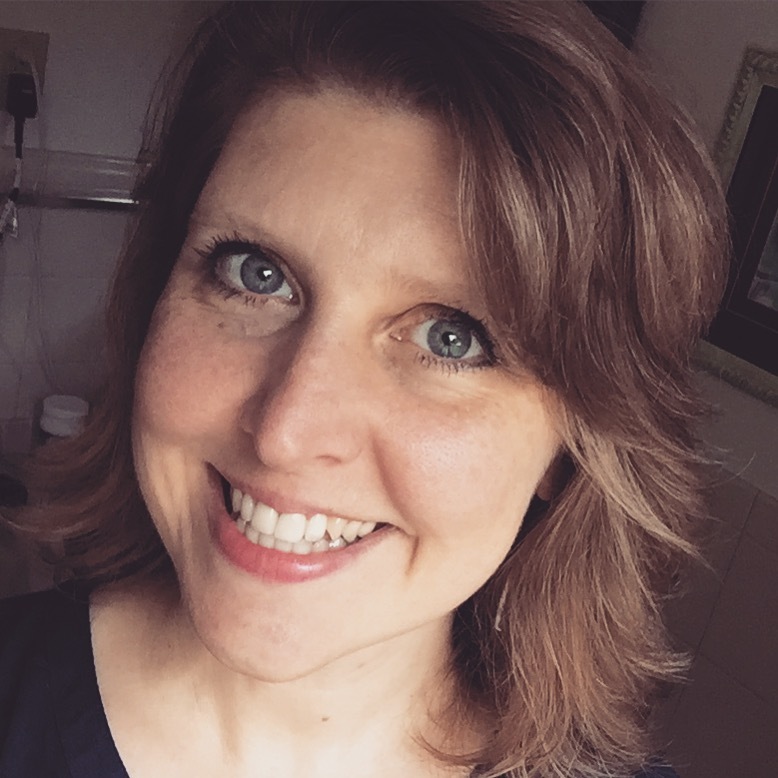 Today I will look at the very concrete clutter that can take over the home of a homeschooling family. I’ve had a unique situation of starting over from scratch in terms of physical possessions. When we left China, we brought eleven trunks. Everything else was abandoned. When we first moved into the guest house where we are staying, it was easy to find a place for everything because “everything” was so little. There was no clutter. Everything we owned was extremely practical (or sentimental). But after being back in America for just a few months, the clutter is seeping back. It’s a truly insidious enemy because it happens so slowly and innocently. 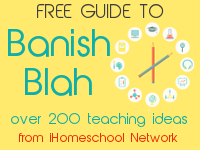 I’ve discovered some tips for myself in dealing with homeschool clutter. 1. Keep the “clutter factor” in mind at thrift stores. I admit that I am crazy about bargains at thrift stores. Yes, the items are cheap, but what is the trade-off back at home? To help control the clutter, I really need to consider the clutter factor. 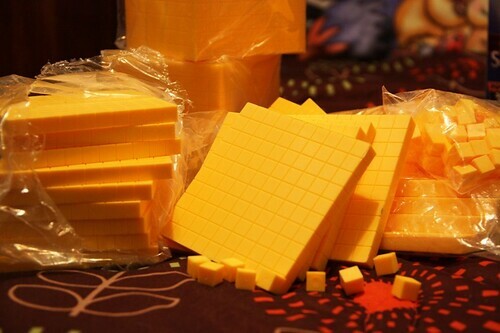 Yes, these math cubes are dirt cheap. But will Sprite use them often enough to warrant finding a place to store them on our limited shelf space? 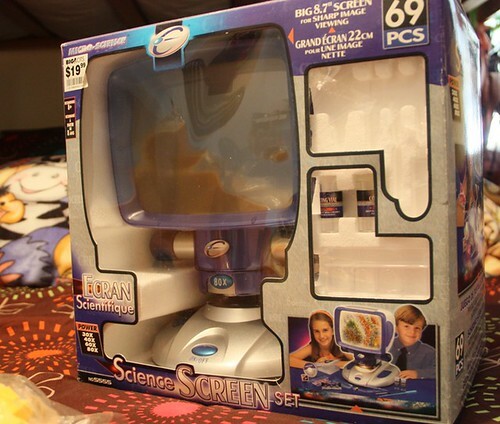 Another example is this science screen we picked up for a mere $1. It was an impulse buy that reads, “I’m-grieving-that-we-had-to leave-behind-a-brand-new-microscope.” We’ve not even pulled it out of the box yet. Granted, $1 is not much, but it is taking up a lot of room on that top shelf. I think it was not a smart move. 2. Keep on top of it. Another strategy I have is to immediately consider storage options when purchasing something new. If possible, I buy a basket or tote at the same time I buy the item. My mom taught me the basket technique for eliminating clutter — any assortment of stuff put into a pretty basket instantly looks organized. Plan a handy spot for that stack of books that you use daily. You know those books are going to pile up. Just accept it and make a place for them. We have a pile on our homeschool table. Use a basket or pretty bookends to make it look more organized instead of mere clutter. Keep supplies in baskets or containers that can be easily reached during school work. The advantage of a basket is that the whole thing can be relocated if necessary. Can I borrow this instead of buying it? Not only is borrowing free but when you’re finished, you don’t have to store the object any more. Can I resell this (or give it away) once I’m finished with it? If there is not a very good possibility of using the book or curriculum again, go ahead and purge. If you’ve not used those games, manipulatives, put them down on the kids’ level. If they are still not touched after a couple of months, go ahead and pack them away in a closet or attic. After a few more months, if no one misses them, give them away, guilt-free. 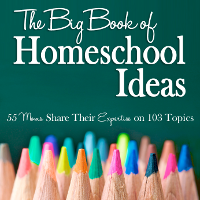 Tomorrow’s post in the Homeschool Spring Cleaning series will be over at The Notebooking Fairy: Organizing Mom’s Homeschool Notebook. It’s the most practical one of all three. All good things to keep in mind. We keep a tote in the garage that goes to Goodwill on a regular basis so I can get rid of things as soon as I realize they are clutter. I have been really purging the clutter in my house and in doing that it has spurred me to keep the clutter in mind when I am out at thrift shops. Thank you for this very practical post. I am inspired. Have you been to my house Jimmie? Book piles and the thrift store indiscretion? Oh my! I am in the midst of clearing out so this was a really helpful post. I never get a bargain- but I do love to organize! I am a purger!! Such great thoughts on all of this. I love what you said about keeping storage in mind even as you’re buying the item. I’m working hard on that. But it’s so hard when it’s such a GREAT item. At such a GREAT price! Clutter overtaketh my house. 🙂 Which is why I am enjoying this series so much! I love your borrowing advice. That’s one I need to do more often. My clutter control method is buying only what we need and after it has lost its educational value for us (after we have educationally outgrown it) I give it away immediately to a family with younger home school kids. I find much pleasure in buying good home school stuff and I find equally a lot of pleasure in passing it on to another family. Expensive books I sell off to finance the next expensive books series. Great tips! I am immediately implementing the “thinking of storage when shopping” idea. We have soooo much homeschool stuff that “could be really useful one day” just because I find such great deals. Thank goodness I no longer live near a used homeschool store!